2002-07-24 First worldwide family litigation filed litigation Critical https://patents.darts-ip.com/?family=9541405&utm_source=google_patent&utm_medium=platform_link&utm_campaign=public_patent_search&patent=US6260556(B1) "Global patent litigation dataset” by Darts-ip is licensed under a Creative Commons Attribution 4.0 International License. The present invention relates to anhydrous compositions for bleaching keratin fibers, in particular the hair, containing at least one alkaline agent, at least one peroxygenated salt, at least one anionic and/or nonionic amphiphilic polymer including at least one fatty chain, and at least one cationic or amphoteric substantive polymer, to the use of these compositions to prepare ready-to-use bleaching compositions by mixing with an aqueous hydrogen peroxide composition, and to a process for bleaching the hair using these anhydrous compositions. The present invention relates to anhydrous compositions for bleaching keratin fibers, in particular the hair, comprising a combination of at least one anionic amphiphilic polymer comprising at least one fatty chain, and/or at least one nonionic amphiphilic polymer comprising at least one fatty chain, and at least one cationic or amphoteric substantive polymer, to the use of these compositions for preparing ready-to-use bleaching compositions, to a process for bleaching keratin fibers using these compositions and to a packaging kit containing such a composition. The bleaching of human keratin fibers, in particular the hair, is carried out by the oxidation of melanin, resulting in the dissolution and partial or total removal of this pigment. Bleaching powders containing a peroxygenated reagent, such as ammonium or alkali metal persulphates, perborates or percarbonates, which are combined with an aqueous hydrogen peroxide composition at the time of use are generally used for bleaching the hair. Since peroxygenated salts and hydrogen peroxide are relatively stable in acidic medium, it is necessary to activate them at basic pH in order to obtain an adequate formation of oxygen. It is thus common to add alkaline compounds such as amines and alkaline silicates to bleaching powders. This chemical treatment with oxidizing and alkaline agents is often very aggressive and modifies the chemical structure of keratin. This is reflected in poor cosmetic properties of the hair, such as difficult disentangling, an unpleasant feel or coarse, dull hair, but especially in a degradation of the keratin fibers. This degradation of the fibers is particularly undesirable since it irreversibly deteriorates the physicochemical properties of the hair. The hair becomes more porous and consequently more difficult to dry. It is more sensitive to various other hair treatments such as dyeing or permanent-waving, and its mechanical properties and surface properties are unfavorably modified, which is reflected, for example, by a reduction in the tractional or breaking strength or an increase in the coefficient of friction. To overcome these drawbacks, use has been made hitherto of cationic or amphoteric substantive polymers. By applying these polymers to the hair, they improve its cosmetic properties, i.e., they make it softer, more shiny and easier to disentangle, but do not make it significantly possible to limit the degradation of keratin fibers. The Inventors have discovered, surprisingly, that it is possible to significantly limit the degradation of keratin fibers by combining the cationic or amphoteric substantive polymer(s) usually used with one or more amphiphilic polymers comprising at least one fatty chain, which are also referred to as anionic and/or nonionic associative polymers. at least one cationic or amphoteric substantive polymer. A subject of the invention is also the use of such an anhydrous composition to prepare a ready-to-use bleaching composition. A further subject of the invention is a process for bleaching keratin fibers using the anhydrous bleaching compositions above, as well as a packaging kit containing such a composition. Other subjects of the invention will become apparent on reading the description and the examples which follow. crosslinking units derived from one or more polyunsaturated monomers. The monomer(s) containing ethylenic unsaturation bearing a carboxylic acid function is(are) chosen from ethacrylic acid, methacrylic acid and acrylic acid, preferably from methacrylic acid and acrylic acid and mixtures thereof. The monomer(s) containing ethylenic unsaturation bearing a hydrophobic side chain can be (i) fatty alkyl esters of unsaturated carboxylic acids, or (ii) allyl fatty alkyl ethers. (i) The fatty alkyl esters of unsaturated carboxylic acids are chosen, for example, from (C10-C30), preferably (C12-C22), alkyl ethacrylates, methacrylates and/or acrylates. They encompass, for example, lauryl acrylate, stearyl acrylate, decyl acrylate, isodecyl acrylate and dodecyl acrylate, as well as the corresponding methacrylates, i.e., lauryl methacrylate, stearyl methacrylate, decyl methacrylate, isodecyl methacrylate and dodecyl methacrylate. R is a hydrocarbon-based group chosen from alkyl, arylalkyl, aryl, alkylaryl and cycloalkyl residues comprising from 8 to 30 carbon atoms, preferably from 10 to 24 carbon atoms, and more particularly from 12 to 18 carbon atoms. One unit of formula (I), which is preferred according to the present invention, is a unit in which R′ denotes a hydrogen atom, n is equal to 10 and R represents a stearyl (C18) radical. The crosslinking monomer is a compound comprising at least two non-conjugated polymerizable double bonds. Examples of which may include, but are not limited to, diallyl phthalate, allyl (meth)acrylate, divinylbenzene, (poly)ethylene glycol dimethacrylate, methylenebisacrylamide, polyallylsucrose or polyallylpentaerythritol. Anionic amphiphilic polymers of the type described above are described, for example, in U.S. Pat. Nos. 3,915,921 and 4,509,949 (copolymers of (m)ethacrylic acid and of (C10-C30) alkyl (m)ethacrylates), or in patent EP-0 216 479 B2 (copolymers of (m)ethacrylic acid and of allyl fatty alcohol ethers), the disclosures of both of which are hereby incorporated by reference. the crosslinked methacrylic acid/ethyl acrylate/steareth-10 allyl ether terpolymer. copolymers of hydrophilic (meth)acrylates and of hydrophobic monomers comprising at least one fatty chain, for example a poly(polyethylene glycol methacrylate/lauryl methacrylate). Polyurethanes comprising at least one fatty chain of (C10-C20) alkyl type and hydroxyethylcelluloses modified with groups comprising at least one (C8-C22) alkyl group are preferred, in particular. The anhydrous compositions contain the anionic and/or nonionic amphiphilic polymer(s) comprising at least one fatty chain in a proportion of from 0.03 to 30% by weight, preferably in a proportion of from 0.3 to 15% by weight. In the bleaching compositions of the present invention, the anionic and/or nonionic amphiphilic polymer(s) comprising at least one fatty chain, which are described above, is(are) combined with at least one cationic or amphoteric substantive polymer. In the cosmetics field, the term substantive polymer means a polymer capable, by virtue of its strong affinity for a support such as the hair, of forming a deposit thereon. The substantive nature is conventionally evaluated by means of the test described by Richard J. Crawford, Journal of the Society of Cosmetic Chemists, 1980, 31(5), pages 273-278, the disclosure of which is hereby incorporated by reference. For the purposes of the present invention, the expression “cationic polymer” denotes any polymer containing cationic groups and/or groups that can be ionized into cationic groups. The cationic polymers, which can be used in accordance with the present invention, can be chosen from any of those already known per se as improving the cosmetic properties of the hair, namely, in particular, those described in patent applications EP-A-337354 and EP-A-557203 and in French Patents FR-2 270 846, 2 383 660, 2 598 611, 2 470 596 and 2 519 863, the disclosures of all of which are hereby incorporated by reference. The preferred cationic polymers are chosen from those which contain units comprising primary, secondary, tertiary and/or quaternary amine groups which can either form part of the main polymer chain or can be borne by a side substituent directly linked thereto. The cationic polymers used generally have a number-average molecular mass from 500 to 5,000,000 approximately, and preferably from 1,000 to 3,000,000 approximately. Among the cationic polymers which can be mentioned more particularly are polymers such as polyamine, polyamino amide and polyquaternary ammonium. X is an anion derived from an inorganic or organic acid, such as a methosulphate anion or a halide such as chloride or bromide. The polymers of the family (1) can also contain one or more units derived from comonomers which can be chosen from the family of acrylamides, methacrylamides, diacetone acrylamides, acrylamides and methacrylamides substituted on the nitrogen with lower (C1-C4) alkyls, acrylic or methacrylic acids or esters thereof, vinyllactams such as vinylpyrrolidone or vinylcaprolactam, and vinyl esters. (2) The cellulose ether derivatives containing quaternary ammonium groups, described in French patent 1,492,597, the disclosure of which is hereby incorporated by reference. These polymers are also defined in the CTFA dictionary as quaternary ammoniums of hydroxyethylcellulose which has reacted with an epoxide substituted with a trimethylammonium group. (3) Cationic cellulose derivatives such as cellulose copolymers or cellulose derivatives grafted with a water-soluble monomer of quaternary ammonium, and described in particular in U.S. Pat. No. 4,131,576, the disclosure of which is hereby incorporated by reference, such as hydroxyalkylcelluloses, for instance hydroxymethyl-, hydroxyethyl- or hydroxypropylcelluloses grafted, in particular, with a methacryloylethyltrimethylammonium, methacrylamidopropyltrimethylammonium or dimethyldiallylammonium salt. (4) The cationic polysaccharides described more particularly in U.S. Pat. Nos. 3,589,578 and 4,031,307, the disclosures of both of which are hereby incorporated by reference, such as guar gums containing cationic trialkylammonium groups. Guar gums modified with a salt (e.g., chloride) of 2,3-epoxypropyltrimethylammonium are used, for example. (5) Polymers comprising piperazinyl units and of divalent alkylene or hydroxyalkylene radicals containing straight or branched chains, optionally interrupted by oxygen, sulphur or nitrogen atoms or by aromatic or heterocyclic rings, as well as the oxidation and/or quaternization products of these polymers. Such polymers are described, in particular, in French patents 2,162,025 and 2,280,361, the disclosures of which are hereby incorporated by reference. (6) Water-soluble polyamino amides prepared in particular by polycondensation of an acidic compound with a polyamine. These polyamino amides can be crosslinked with an epihalohydrin, a diepoxide, a dianhydride, an unsaturated dianhydride, a bis-unsaturated derivative, a bis-halohydrin, a bis-azetidinium, a bis-haloacyldiamine, a bis-alkyl halide or alternatively with an oligomer resulting from the reaction of a difunctional compound which is reactive with a bis-halohydrin, a bis-azetidinium, a bis-haloacyldiamine, a bis-alkyl halide, an epihalohydrin, a diepoxide or a bis-unsaturated derivative. The crosslinking agent is used in proportions ranging from 0.025 to 0.35 mol per amine group of the polyamino amide. These polyamino amides can be alkylated or, if they contain one or more tertiary amine functions, they can be quaternized. Such polymers are described, in particular, in French patents 2,252,840 and 2,368,508, the disclosures of both of which are hereby incorporated by reference. (7) The polyamino amide derivatives resulting from the condensation of polyalkylene polyamines with polycarboxylic acids followed by alkylation with difunctional agents. Mention may be made, for example, of adipic acid/dialkylaminohydroxyalkyldialkylenetriamine polymers in which the alkyl radical contains from 1 to 4 carbon atoms and preferably denotes methyl, ethyl or propyl. Such polymers are described in particular in French patent 1,583,363, the disclosure of which is hereby incorporated by reference. Among these derivatives, mention may be made more particularly of the adipic acid/dimethylaminohydroxypropyl/diethylenetriamine polymers sold under the name CARTARETINE F, F4 or F8 by the company Sandoz. (8) The polymers obtained by reaction of a polyalkylene polyamine containing two primary amine groups and at least one secondary amine group with a dicarboxylic acid chosen from diglycolic acid and saturated aliphatic dicarboxylic acids having from 3 to 8 carbon atoms. The molar ratio between the polyalkylene polyamine and the dicarboxylic acid is from 0.8:1 to 1.4:1. The polyamino amide resulting therefrom is reacted with epichlorohydrin in a molar ratio of epichlorohydrin relative to the secondary amine group of the polyamino amide of from 0.5:1 to 1.8:1. Such polymers are described in particular in U.S. Pat. Nos. 3,227,615 and 2,961,347, the disclosures of both of which are hereby incorporated by reference. Y− is an anion such as bromide, chloride, acetate, borate, citrate, tartrate, bisulphate, bisulphite, sulphate or phosphate. These polymers are described in particular in French patent 2,080,759 and in its Certificate of Addition 2,190,406, the disclosures of which are hereby incorporated by reference. d) a ureylene group of formula: —NH—CO—NH—. Preferably, X− is an anion such as chloride or bromide. These polymers generally have a number-average molecular mass ranging from 1,000 to 100,000. Polymers of this type are described, in particular, in French patents 2 320 330, 2 270 846, 2 316 271, 2 336 434 and 2 413 907 and U.S. Pat. Nos. 2,273,780, 2,375,853, 2,388,614, 2,454,547, 3,206,462, 2,261,002, 2,271,378, 3,874,870, 4,001,432, 3,929,990, 3,966,904, 4,005,193, 4,025,617, 4,025,627, 4,025,653, 4,026,945 and 4,027,020, the disclosures of all of which are hereby incorporated by reference. X− is an anion derived from an inorganic or organic acid. A is chosen from a dihalide radical or preferably represents —CH2—CH2—O—CH2—CH2—. Such compounds are described in particular in patent application EP-A-122,324, the disclosure of which is hereby incorporated by reference. (12) Quaternary polymers of vinylpyrrolidone and of vinylimidazole. (13) Polyamines such as the product referred to under the name Polyethylene glycol (15) tallow polyamine in the CTFA dictionary. (14) Crosslinked polymers of methacryloyloxy (C1-C4)alkyltri(C1-C4)alkylammonium salts, such as the polymers obtained by homopolymerization of dimethylaminoethyl methacrylate quaternized with methyl chloride, or by copolymerization of acrylamide with dimethylaminoethyl methacrylate quaternized with methyl chloride, the homopolymerization or copolymerization being followed by crosslinking with a compound containing olefinic unsaturation, in particular methylenebisacrylamide. It is more particularly possible to use an acrylamide/methacryloyloxyethyl trimethylammonium chloride (20/80 by weight) crosslinked copolymer in the form of a dispersion containing 50% by weight of the said copolymer in mineral oil. This dispersion is sold under the name SALCARE® SC 92 by the company Allied Colloids. It is also possible to use a crosslinked homopolymer of methacryloyloxyethyl trimethylammonium chloride containing about 50% by weight of the homopolymer in mineral oil or in a liquid ester. These dispersions are sold under the names SALCARE® SC 95 and SALCARE® SC 96 by the company Allied Colloids. The methosulphate of the copolymer of methacryloyloxyethyl trimethylammonium and of methacryloyloxyethyldimethylacetylammonium, sold under the name PLEX7525L by the company Rohm GmbH (CTFA name: Polyquaternium-35), can also be used. Other cationic polymers, which can be used in the context of the invention, are polyalkyleneimines, in particular polyethyleneimines, polymers containing vinylpyridine or vinylpyridinium units, condensates of polyamines and epichlorohydrin, polyquaternary ureylenes and chitin derivatives. K and M can also be chosen from a cationic polymer chain containing primary, secondary, tertiary or quaternary amine groups, in which at least one of the amine groups bears a carboxylic or sulphonic group connected via a hydrocarbon radical or alternatively K and M form part of a chain of a polymer containing an α,β-dicarboxylic ethylene unit in which one of the carboxylic groups has been made to react with a polyamine containing one or more primary or secondary amine groups. (1) polymers resulting from the copolymerization of a monomer derived from a vinyl compound bearing a carboxylic group such as, more particularly, acrylic acid, methacrylic acid, maleic acid, α-chloroacrylic acid, and a basic monomer derived from a substituted vinyl compound containing at least one basic atom, such as, more particularly, dialkylaminoalkyl methacrylates and acrylates, dialkylaminoalkylmethacrylamides and -acrylamides. Such compounds are described in U.S. Pat. No. 3,836,537, the disclosure of which is hereby incorporated by reference. Mention may also be made of the sodium acrylate/acrylamidopropyltrimethylammonium chloride copolymer. The vinyl compound can also be a dialkyldiallylammonium salt such as diethyldiallylammonium chloride. c) at least one basic comonomer such as esters containing primary, secondary, tertiary and quaternary amine substituents of acrylic and methacrylic acids and the product of quaternization of dimethylaminoethyl methacrylate with dimethyl or diethyl sulphate. The N-substituted acrylamides or methacrylamides, which are more particularly preferred according to the invention, are groups in which the alkyl radicals contain from 2 to 12 carbon atoms and more particularly N-ethylacrylamide, N-tert-butylacrylamide, N-tert-octylacrylamide, N-octylacrylamide, N-decylacrylamide, N-dodecylacrylamide and the corresponding methacrylamides. The acidic comonomers are chosen more particularly from acrylic acid, methacrylic acid, crotonic acid, itaconic acid, maleic acid and fumaric acid and alkyl monoesters, having 1 to 4 carbon atoms, of maleic or fumaric acids or anhydrides. The preferred basic comonomers are aminoethyl, butylaminoethyl, N,N′-dimethylaminoethyl and N-tert-butylaminoethyl methacrylates. The copolymers whose CTFA (4th edition, 1991), the disclosure of which is hereby incorporated by reference, name is octylacrylamide/acrylates/butylaminoethyl methacrylate copolymer are particularly used. c) in proportions of from 0 to 20 mol %, the —NH—(CH2)6—NH— radical derived from hexamethylenediamine. These polyamino amines being crosslinked by addition of a difunctional crosslinking agent chosen from epihalohydrines, diepoxides, dianhydrides and bis-unsaturated derivatives, using from 0.025 to 0.35 mol of crosslinking agent per amine group of the polyamino amide and alkylated by the action of acrylic acid, chloroacetic acid or an alkane sultone, or salts thereof. The saturated carboxylic acids are preferably chosen from acids having from 6 to 10 carbon atoms, such as adipic acid, 2,2,4-trimethyladipic acid and 2,4,4-trimethyladipic acid, terephthalic acid, acids containing an ethylenic double bond such as, for example, acrylic acid, methacrylic acid and itaconic acid. The alkane sultones used in the alkylation are preferably propane sultone or butane sultone, the salts of the alkylating agents are preferably the sodium or potassium salts. R27 and R28 are chosen from a hydrogen atom or an alkyl radical such that the sum of the carbon atoms in R27 and R28 does not exceed 10. The polymers comprising such units can also contain units derived from non-zwitterionic monomers such as dimethyl- or diethylaminoethyl acrylate or methacrylate or alkyl acrylates or methacrylates, acrylamides or methacrylamides or vinyl acetate. By way of example, mention may be made of the copolymer of methyl methacrylate/dimethyl carboxymethylammonio methyl ethylmethacrylate. or, if q=1, R30, R31 and R32 each represent a hydrogen atom, as well as the salts formed by these compounds with bases or acids. (6) polymers derived from the N-carboxyalkylation of chitosan, such as N-carboxymethylchitosan or N-carboxybutylchitosan. r is such that the molecular mass of the final polymer is from 500 to 5,000,000, and preferably from 1,000 to 3,000,000. R37 is chosen from a —CH2—CH2—, —CH2—CH2—CH2— or —CH2—CH(CH3)— group as well as the higher homologues of these radicals and containing up to 6 carbon atoms. and X denotes the symbol E or E′ and at least once E′; E having the meaning given above and E′ is a divalent radical which is an alkylene radical with a straight or branched chain having up to 7 carbon atoms in the main chain, which is unsubstituted or substituted with one or more hydroxyl radicals and containing one or more nitrogen atoms, the nitrogen atom being substituted with an alkyl chain which is optionally interrupted by an oxygen atom and necessarily containing one or more carboxyl functions or one or more hydroxyl functions and betainized by reaction with chloroacetic acid or sodium chloroacetate. (9) (C1-C5)alkyl vinyl ether/maleic anhydride copolymers partially modified by semiamidation with an N,N-dialkylaminoalkylamine such as N,N-dimethyl-aminopropylamine or by semiesterification with an N,N-dialkanolamine. These copolymers can also contain other vinyl comonomers such as vinylcaprolactam. The cationic or amphoteric substantive polymers can also bear hydrophobic groups. polyacrylates containing amino side groups, which may or may not be quaternized, possessing hydrophobic groups. The alkyl radicals borne by the above celluloses or hydroxyethylcelluloses containing quaternary ammonium groups preferably comprise from 8 to 30 carbon atoms. The aryl radicals preferably are chosen from phenyl, benzyl, naphthyl or anthryl groups. the acrylamide/dimethyldiallylammonium chloride/acrylic acid terpolymer sold under the name MERQUAT PLUS 3330 DRY by the company Calgon (CTFA name: Polyquaternium-39). In the above list of substantive polymers, the amphoteric copolymers Polyquaternium-22, Polyquaternium-39 and Polyquaternium-47 (CTFA names) are preferred most particularly. The anhydrous bleaching compositions contain the cationic or amphoteric substantive polymer in a proportion of from 0.03 to 30% by weight, preferably in a proportion of from 0.3 to 15% by weight, relative to the anhydrous composition. The weight ratio of the anionic and/or nonionic amphiphilic polymer(s) to the cationic or amphoteric substantive polymer ranges generally from 10:1 to 1:10 and preferably from 5:1 to 1:5. As indicated above, the anhydrous bleaching composition contains at least one alkaline agent and at least one peroxygenated salt. The alkaline agent is chosen from ammonium salts such as ammonium chloride, sulphate, phosphate or nitrate, alkali metal or alkaline-earth metal silicates, phosphates or carbonates, in particular alkali metal metasilicates. The peroxygenated salts are chosen from ammonium or alkali metal persulphates, percarbonates and perborates. Persulphates are preferably used and, among these, mainly sodium persulphate and potassium persulphate. The compositions of the invention contain from 20 to 70% by weight, and preferably from 30 to 60% by weight, of peroxygenated salt relative to the total weight of the anhydrous composition. The bleaching compositions according to the present invention can also contain adjuvants of any kind usually used in bleaching compositions, which are capable of facilitating the handling and application, of improving the storage or efficacy of the compositions and of improving the cosmetic properties of the treated hair. These adjuvants are, for example, agents for controlling the release of oxygen, such as magnesium carbonate and magnesium oxide, water-soluble thickening or gelling polymers such as celluloses and derivatives thereof, for instance hydroxyethylcellulose, hydroxypropylcellulose and hydroxypropylmethylcellulose, starch and starch derivatives, hydroxypropyl guar and guar gum, alginates, polysaccharides, polyvinylpyrrolidone, carboxymethylcellulose, xanthan gum, gum arabic, gatti gum, gum tragacanth, polyacrylamides and poly(acrylic acids), anionic, nonionic, cationic, amphoteric or zwitterionic surfactants and mixtures thereof, mineral or plant oils, waxes, granulation adjuvants, binders, mineral fillers such as silica and clay, opacifiers such as titanium oxide, dyes, sequestering agents and fragrances. Needless to say, a person skilled in the art will take care to select this or these optional additional compound(s) and the amount thereof, such that the advantageous properties intrinsically associated with the bleaching composition in accordance with the invention are not, or are not substantially, adversely affected by the addition(s) envisaged. The compositions of the invention preferably comprise at least one surfactant. As examples of anionic surfactants which can be used, alone or as mixtures, in the context of the present invention, mention may be made in particular of salts (in particular alkali metal salts, especially sodium salts, ammonium salts, amine salts, amino alcohol salts or magnesium salts) of the following compounds: alkyl sulphates, alkyl ether sulphates, alkylamidoether sulphates, alkylarylpolyether sulphates, monoglyceride sulphates; alkyl sulphonates, alkyl phosphates, alkylamide sulphonates, alkylaryl sulphonates, α-olefin sulphonates, paraffin sulphonates; (C6-C24)alkyl sulphosuccinates, (C6-C24)alkyl ether sulphosuccinates, (C6-C24)alkylamide sulphosuccinates; (C6-C24)alkyl sulphoacetates; (C6-C24)acyl sarcosinates and (C6-C24)acyl glutamates. It is also possible to use (C6-C24)alkylpolyglycoside carboxylic esters such as alkylglucoside citrates, alkylpolyglycoside tartrate and alkylpolyglycoside sulphosuccinates, alkyl sulphosuccinamates; acyl isethionates and N-acyltaurates, the alkyl or acyl radical of all these various compounds preferably comprising from 12 to 20 carbon atoms, and the aryl radical preferably denoting a phenyl or benzyl group. Among the anionic surfactants which can also be used, mention may also be made of fatty acid salts such as oleic, ricinoleic, palmitic and stearic acid salts, coconut oil acid or hydrogenated coconut oil acid; acyl lactylates in which the acyl radical comprises 8 to 20 carbon atoms. Alkyl D-galactosiduronic acids and salts thereof, polyoxyalkylenated (C6-C24)alkyl ether carboxylic acids, polyoxyalkylenated (C6-C24)alkylaryl ether carboxylic acids and polyoxyalkylenated (C6-C24)alkylamido ether carboxylic acids and salts thereof, in particular those comprising from 2 to 50 alkylene oxide groups, in particular ethylene oxide groups and mixtures thereof, can also be used. The nonionic surfactants are, themselves also, compounds that are well known per se (see in particular in this respect “Handbook of Surfactants” by M. R. Porter, published by Blackie & Son (Glasgow and London), 1991, pp. 116-178), the disclosure of which is hereby incorporated by reference, and, in the context of the present invention, their nature is not a critical feature. Thus, they can be chosen in particular from polyethoxylated or polypropoxylated fatty acids, alkylphenols, α-diols or alcohols having a fatty chain containing, for example, 8 to 18 carbon atoms, it being possible for the number of ethylene oxide or propylene oxide groups to range in particular from 2 to 50. Mention may also be made of copolymers of ethylene oxide and of propylene oxide, condensates of ethylene oxide and of propylene oxide with fatty alcohols; polyethoxylated fatty amides preferably having from 2 to 30 mol of ethylene oxide, polyglycerolated fatty amides containing on average 1 to 5, and in particular 1.5 to 4, glycerol groups; polyethoxylated fatty amines preferably having 2 to 30 mol of ethylene oxide; oxyethylenated fatty acid esters of sorbitan having from 2 to 30 mol of ethylene oxide; fatty acid esters of sucrose, fatty acid esters of polyethylene glycol, alkylpolyglycosides, N-alkylglucamine derivatives, amine oxides such as (C10-C14)alkylamine oxides or N-acylaminopropylmorpholine oxides. It will be noted that the alkylpolyglycosides constitute nonionic surfactants that are particularly suitable in the context of the present invention. The amphoteric or zwitterionic surfactants, whose nature is not a critical feature in the context of the present invention, can be, in particular aliphatic secondary or tertiary amine derivatives in which the aliphatic radical is a linear or branched chain containing 8 to 18 carbon atoms and containing at least one water-soluble anionic group (for example carboxylate, sulphonate, sulphate, phosphate or phosphonate). Mention may also be made of (C8-C20)alkylbetaines, sulphobetaines, (C8-C20)alkylamido(C1-C6)alkylbetaines or (C8-C20)alkylamido-(C1-C6)alkylsulphobetaines. R38′ is an alkyl radical of an acid R38′—COOH present in coconut oil or in hydrolyzed linseed oil, an alkyl radical, in particular a C7, C9, C11 or C13 alkyl radical, a C17 alkyl radical and its iso form, an unsaturated C17 radical. These compounds are classified in the CTFA dictionary, 5th edition, 1993, the disclosure of which is hereby incorporated by reference, under the names disodium cocoamphodiacetate, disodium lauroamphodiacetate, disodium caprylamphodiacetate, disodium capryloamphodiacetate, disodium cocoamphodipropionate, disodium lauroamphodipropionate, disodium caprylamphodipropionate, disodium capryloamphodipropionate, lauroamphodipropionic acid, cocoamphodipropionic acid. Among the cationic surfactants which may be mentioned in particular are: optionally polyoxyalkylenated primary, secondary or tertiary fatty amine salts; quaternary ammonium salts such as tetraalkylammonium, alkylamidoalkyltrialkylammonium, trialkylbenzylammonium, trialkylhydroxyalkylammonium or alkylpyridinium chlorides or bromides; imidazoline derivatives; or amine oxides of cationic nature. The amounts of surfactants present in the composition according to the invention can vary from 0.01 to 40% and preferably from 0.1 to 30% of the total weight of the composition. The anhydrous bleaching composition can be in the form of a powder which produces a poultice after mixing with aqueous hydrogen peroxide solution. It can also be in the form of an anhydrous bleaching cream containing pulverulent agents suspended or dispersed in an organic solvent, such as the creams described in patents U.S. Pat. No. 4,170,637, DE 3 814 356, DE 3 844 956, EP 0 778 020 and DE 1 972 3538, the disclosures of all of which are hereby incorporated by reference. According to the present invention, the anhydrous bleaching composition is preferably in the form of a powder of coated, uncoated or granulated particles. A subject of the present invention is also a process for bleaching keratin fibers, in particular human hair. removing the bleaching mixture by rinsing with water, followed by washing with a shampoo, and then drying. A further subject of the invention is the use of an anhydrous bleaching composition, as described above, to prepare a ready-to-use bleaching composition. For this, the anhydrous composition is mixed with about 0.5 to 10 equivalents by weight of an aqueous hydrogen peroxide composition, for example a solution, an emulsion or a gel with a weight concentration of from 2 to 12%. This mixing must be carried out immediately before applying the product to the hair. The pH of the ready-to-use bleaching composition is preferably from 7 to 12 and even more preferably from 8.5 to 11.5. Another subject of the invention is a packaging device in several parts, also known as a packaging “kit”, comprising at least two compartments, one of which contains an anhydrous bleaching composition as described above, and the other of which contains an aqueous hydrogen peroxide composition. The examples given below, purely by way of illustration and with no limiting nature, will allow the invention to be understood more clearly. 8 g of each of the bleaching compositions A, B and C were mixed with 16 g of the hydrogen peroxide composition D.
A lock of hair was immersed in each of the ready-to-use compositions, after starting the timer, and the lock was then spread out in a fan shape on a plate thermostatically maintained at 31° C. The fanned-out lock was coated with half of the mixture and was left to stand for 20 minutes. After 20 minutes, the lock was quickly turned over and coated with the rest of the mixture, then left to stand for a further 20 minutes. At the end of the exposure time, the lock was rinsed thoroughly with water until the water was clear. A neutralizing shampoo-wash was carried out in order to remove any traces of oxidizing agent. The lock was disentangled with a comb and dried for 1 hour with an electric dryer at 60° C., while protecting it with a paper towel. The lock was once again moistened and washed again with standard shampoo. It was disentangled and then dried again for 1 hour with an electric dryer at 60° C.
After bleaching, each 3 g lock was divided into 5 locks of 0.6 g, each of these locks being subjected to the alkaline solubility test described below. Each of the 5 locks was placed in a crystallizing dish which was put in an oven at 60° C. for 30 minutes; the crystallizing dishes containing the locks were weighed after heating them in an oven (P0). The locks were removed from the crystallizing dishes and these empty dishes were weighed (P1). Next, the locks were put back into the crystallizing dishes and these dishes were placed in a desiccator for 24 hours. 40 ml of NaOH (0.1 N) solution were introduced into 50 ml conical flasks and the flasks were placed on a waterbath thermostatically maintained at 65° C. When the temperature was stabilized, the locks of hair to be tested were immersed for 30 minutes in the alkaline solution, stirring cautiously 2 to 3 times. The locks of hair were removed and a series of three washes was then carried out, each wash comprising immersing the lock for 15 minutes in 100 ml of demineralized water while stirring gently from time to time. The locks thus rinsed were then left to drip-dry and were placed in the pre-tared crystallizing dishes (P1). The crystallizing dish+lock assembly was placed in an oven and dried for 24 hours at 105° C. After cooling for 45 minutes in a desiccator, the crystallizing dishes containing the locks were weighed again (P2). in which (P0-P2) represents the weight loss of the lock during the test and (P0-P1-a) represents the initial weight of the lock, a corresponding to the weight of the lock attachment (0.07 g). Measurement of the alkaline solubility of the hair makes it possible to take account of the degradation of the keratin fibers resulting from their bleaching. Specifically, oxidation of the disulphide bridges of keratin into sulphonic acid groups during the bleaching increases the solubility of the treated hair in an alkaline solution. The higher the alkaline solubility, the greater the degradation of the fiber. The results of these alkaline solubility tests summarized in the table below are the average values calculated from the results for 5 individual locks. These results show that the use of the amphoteric substantive polymer (Polyquaternium-22) alone (composition BD) does not make it possible to limit the degradation of the fiber when compared with the composition containing neither substantive polymer nor amphiphilic polymer (composition AD). On the other hand, the combination according to the invention of an anionic amphiphilic copolymer of acrylic acid and of (C10-C30) alkyl acrylate (CARBOPOL1382 from the company Goodrich) with the amphoteric substantive polymer Polyquaternium-22 (composition CD) significantly reduces the alkaline solubility of the bleached keratin fibers. 8 g of this composition E were mixed with 16 g of composition D described above. This mixture was applied and maintained on hair to be bleached, for 45 minutes. After rinsing, shampooing and drying, a uniform bleaching effect was obtained. The state of the fiber was satisfactory, with limited degradation. 10 g of this composition F were mixed with 15 g of composition D described above. This mixture was applied to and maintained on hair to be bleached, for 45 minutes. After rinsing, shampooing and drying, a uniform bleaching effect was obtained. The state of the fiber was satisfactory, with limited degradation. The foregoing written description relates to various embodiments of the present invention. Numerous changes and modifications may be made therein without departing from the spirit and scope of the invention as defined in the following claims. at least one substantive polymer chosen from cationic and amphoteric substantive polymers. 2. The composition according to claim 1, wherein the keratin fibers are human keratin fibers. hydrophobic units derived from one or more monomers containing ethylenic unsaturation and bearing a hydrophobic side chain. 4. The composition according to claim 3, wherein the monomers containing ethylenic unsaturation and bearing a carboxylic acid function are chosen from ethacrylic acid, methacrylic acid and acrylic acid, and mixtures thereof. 5. The composition according to claim 3, wherein the monomers containing ethylenic unsaturation and bearing a carboxylic acid function are chosen from methacrylic acid and acrylic acid. 6. The composition according to claim 3, wherein the monomers containing ethylenic unsaturation and bearing a hydrophobic side chain are chosen from (C10-C30), alkyl ethacrylates, methacrylates and acrylates. 7. The composition according to claim 3, wherein the monomers containing ethylenic unsaturation and bearing a hydrophobic side chain are chosen from (C12-C22), alkyl ethacrylates, methacrylates and acrylates. R is a hydrocarbon-based group chosen from alkyl, arylalkyl, aryl, alkylaryl and cycloalkyl residues comprising from 8 to 30 carbon atoms. 9. The composition according to claim 8, wherein R is a hydrocarbon-based group chosen from alkyl, arylalkyl, aryl, alkylaryl and cycloalkyl residues comprising from 10 to 24 carbon atoms. 10. The composition according to claim 1, wherein the at least one anionic amphiphilic polymer comprising at least one fatty chain also comprises units derived from a crosslinking monomer containing two non-conjugated ethylenic double bonds. 11. The composition according to claim 10, wherein the crosslinking monomer is chosen from diallyl phthalate, allyl (meth)acrylate, divinylbenzene, (poly)ethylene glycol dimethacrylate, methylenebisacrylamide, polyallylsucrose or polyallylpentaerythritol. 12. The composition according to claim 1, wherein the at least one anionic amphiphilic polymer comprising at least one fatty chain is a crosslinked copolymer of acrylic acid and of C10-C30 alkyl acrylate. copolymers of hydrophilic (meth)acrylates and of hydrophobic monomers comprising at least one fatty chain. 14. 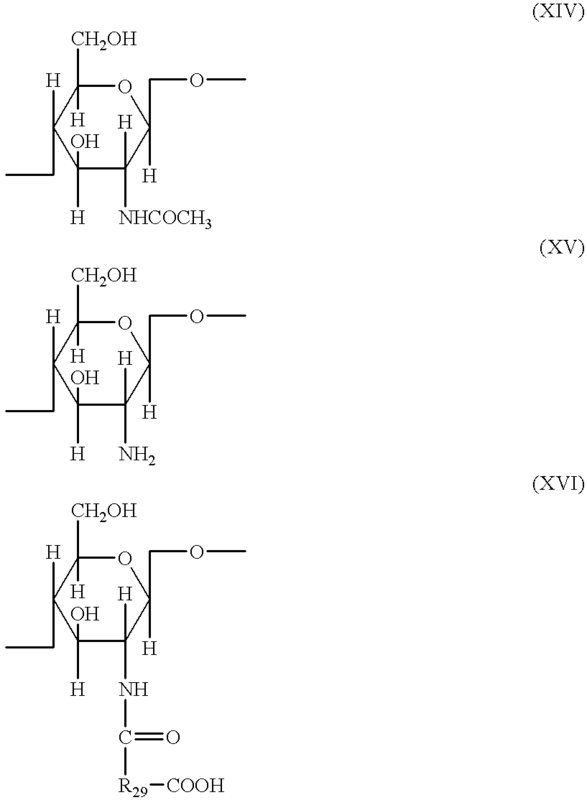 The composition according to claim 13, wherein the at least one nonionic amphiphilic polymer comprising at least one fatty chain is a hydroxyethylcellulose modified with groups comprising at least one (C8-C22) alkyl group or a polyurethane modified with at least one (C10-C20) alkyl chain. 15. The composition according to claim 1, wherein the at least one amphiphilic polymer is present in the composition in an amount ranging from 0.03 to 30% by weight relative to the total weight of the composition. 16. The composition according to claim 15, wherein the at least one amphiphilic polymer is present in the composition in an amount ranging from 0.3 to 15% by weight relative to the total weight of the composition. 17. The composition according to claim 1, wherein the at least one substantive polymer chosen from cationic and amphoteric substantive polymers is a polymer containing units comprising amine groups chosen from primary, secondary, tertiary and quaternary amine groups which can either form part of the main chain of the polymer or can be borne by a side substituent which is directly connected thereto, said polymer having a number-average molecular mass ranging from 500 to 5,000,000. 18. The composition according to claim 17, wherein the at least one substantive polymer has a number-average molecular mass ranging from 1000 to 3,000,000. 19. The composition according to claim 17, wherein said at least one substantive polymer is chosen from quaternized cellulose derivatives and polyacrylates containing quaternized or non-quaternized amino side groups. quaternized hydroxyethylcelluloses modified with groups comprising at least one fatty chain, chosen from alkyl, arylalkyl and alkylaryl groups comprising at least 8 carbon atoms, or mixtures thereof. 21. 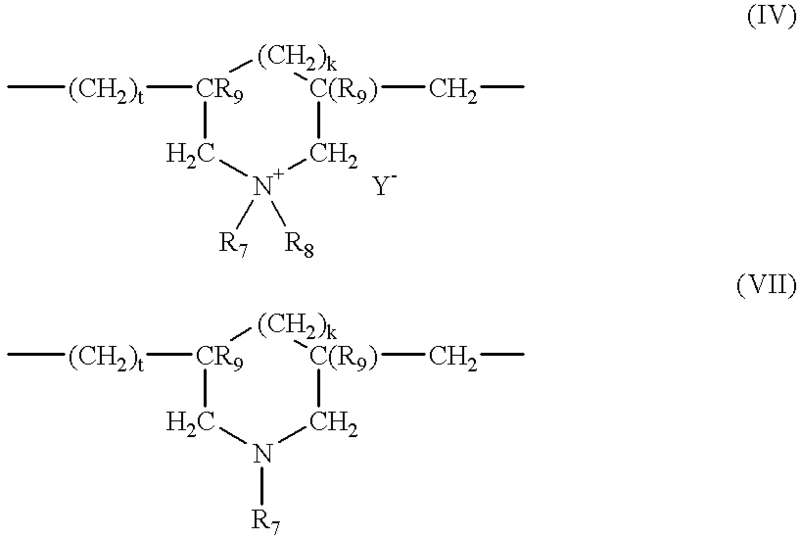 The composition according to claim 17, wherein the at least one cationic substantive polymer is a dimethyldiallylammonium chloride homopolymer or a copolymer of dimethyldiallylammonium and of acrylamide. D is chosen from a single bond and a group —(CH2)r—CO— in which r is 4 or 7. 23. The composition according to claim 17, wherein the at least one amphoteric substantive polymer is chosen from Polyquaternium-22, Polyquaternium-39 and Polyquaternium47. 24. The composition according to claim 1, wherein the at least one substantive polymer is present in the composition in an amount ranging from 0.03 to 30% by weight relative to the total weight of the composition. 25. The composition according to claim 24, wherein the at least one substantive polymer is present in the composition in an amount ranging from 0.3 to 15% by weight relative to the total weight of the composition. 26. The composition according to claim 1, wherein the at least one amphiphilic polymer and the at least one substantive polymer are present in said composition in a weight ratio ranging from 10:1 to 1:10. 27. The composition according to claim 26, wherein the at least one amphiphilic polymer and the at least one substantive polymer are present in said composition in a weight ratio ranging from 5:1 to 1:5. 28. The composition according to claim 1, wherein the at least one alkaline agent is chosen from ammonium salts, and alkali metal or alkaline-earth metal silicates, phosphates or carbonates. 29. The composition according to claim 28, wherein the ammonium salts are chosen from ammonium chloride, sulphate, phosphate and nitrate. 30. The composition according to claim 28, wherein the at least one alkaline agent is an alkali metal metasilicate. 31. The composition according to claim 1, wherein the at least one peroxygenated salt is chosen from the ammonium and alkali metal persulphates, percarbonates and perborates. 32. The composition according to claim 1, wherein the at least one peroxygenated salt is chosen from sodium persulphate and potassium persulphate. 33. The composition according to claim 1, wherein the at least one peroxygenated salt is present in the composition in an amount ranging from 20 to 70% by weight calculated relative to the total weight of the composition. 34. The composition according to claim 33, wherein the at least one peroxygenated salt is present in the composition in an amount ranging from 30 to 60% by weight calculated relative to the total weight of the composition. 35. The composition according to claim 1, wherein the composition further comprises bleaching adjuvants chosen from agents for controlling the release of oxygen, thickening or gelling polymers, anionic, nonionic, cationic, amphoteric or zwitterionic surfactants and mixtures thereof, mineral or plant oils, waxes, granulating adjuvants, binders, mineral fillers, opacifiers, dyes, sequestering agents and fragrances. 36. The composition according to claim 35, wherein the opacifier is titanium oxide. 37. The composition according to claim 35, wherein the composition comprises from 0.01 to 40% by weight of at least one surfactant. 38. The composition according to claim 37, wherein the composition further comprises from 0.1 to 30% by weight of at least one surfactant. 39. The composition according claim 1, wherein the composition is in the form of a powder, or of a suspension or dispersion of powder in an anhydrous organic liquid support. 40. 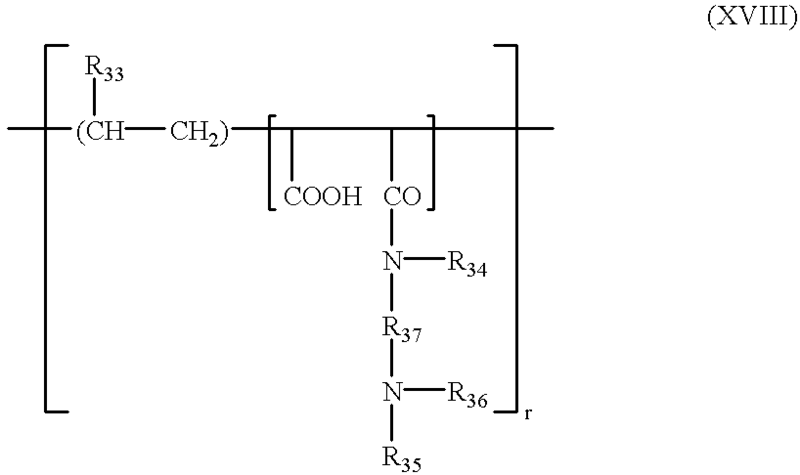 The composition according to claim 1, further comprising a medium suitable for bleaching. 42. The process according to claim 41, wherein said anhydrous bleaching composition comprises a medium suitable for bleaching. the second compartment contains an aqueous hydrogen peroxide composition. 44. The device according to claim 43, wherein the keratin fibers are human keratin fibers. 45. The device according to claim 44, wherein the human keratin fibers are hair. 46. A ready-to-use bleaching composition comprising an aqueous hydrogen peroxide composition and an anhydrous composition comprising at least one alkaline agent, at least one peroxygenated salt, at least one amphiphilic polymer chosen from nonionic and anionic amphiphilic polymers and comprising at least one fatty chain, and at least one substantive polymer chosen from cationic and amphoteric substantive polymers. 47. The composition according to claim 46, wherein said aqueous hydrogen peroxide composition is present in said bleaching composition in an amount ranging from 0.5 to 10 equivalents by weight of said anhydrous composition. FR2920971B1 (en) 2007-09-14 2014-03-28 Oreal cosmetic composition comprising at least one specific cationic polymer, at least one surfactant, at least one cationic or amphoteric polymer and at least one mineral particle, and cosmetic treatment process. M.R. Porter, "Handbook of Surfactants", Blackie & Son Ltd., Glasgow and London, 1991, pp. 116-178. Richard J. Crawford et al., "A replacement for Rubine dye for detecting cationics on keratin", J. Soc. Cosmet Chem., vol. 31, No. 5, Sep./Oct. 1980, pp. 273-278. ES2349767T3 (en) 2011-01-11 Cosmetic compositions containing one aminosilicone and a thickening agent and uses thereof. ES2313876T3 (en) 2009-03-16 Composition for the oxidation dyeing of keratinous fibers. ES2261616T3 (en) 2006-11-16 Composition for the oxidation dyeing of keratinous fibers containing oxyalkylenated carboxylic ether acid, an associative polymer and an unsaturated fatty alcohol. ES2330838T3 (en) 2009-12-16 Use of dicationic dyeing compounds of human keratinous fibers and compositions containing them.